I get a lot of inquiries about golf from people looking for a good place to retire overseas that also gives them a chance to continue to play the game. And, according to most of these inquiries, I don’t talk about golf often enough. So this week I’m going to report on two established projects that offer three things: a great place to live and own property, miles of unspoiled beaches, and golf. Estrella del Mar is a huge, 850-acre residential and golf project that sits alone on a stretch of 10 miles of pristine beach… 3.5 miles of which belong to the development. It’s located just south of Mazatlán, Mexico, about 15 minutes from the international airport. This project is perfect for those who want an undeveloped beach out front and the area’s best golf course out back. Plus, you’ve got all the amenities of Mazatlán close at hand. The golf course is a spectacular, 18-hole, Robert Trent Jones championship course, and a host on the Latin America PGA Tour. The course is par 72 (7,015 yards) with six holes running along the ocean. I spoke with a golf pro just this morning—he is also a homeowner here—who chose Estrella del Mar over several good local options, expressly for the quality of the course. I met a number of golfers in residence here, as well as some playing the course. They were a friendly and neighborly crowd, many of whom seemed to know each other. Aside from the golf, you can enjoy two restaurants and a full-service bar with poolside service. The gym is fully equipped, and the spa includes sauna and steam rooms, along with massages, aromatherapy, and other therapeutic treatments. Estrella del Mar has a large selection of diverse properties for sale. They offer residential building lots of various sizes and settings, which range from US$50,000 up to over US$500k for lots on the beach. 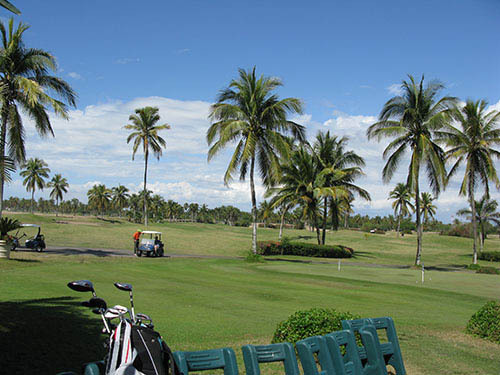 Golf-view and ocean-view lots start at US$115,700. But the best sellers here are the new condos. The 1,000 square foot, one-bedroom units (1.5 baths) start at US$204,000… two bedrooms start at US$336,900, and three-bed, three-bath units start at US$441,000. If you want to rent your property out, full-service property management is available on site. But here’s the best deal you’ll find on a condo at Estrella del Mar. A friend of mine who lives in Arizona just bought a new house in the Mazatlán area and needs to sell his golf condo. It’s an impressive 1,000 square feet (almost 94 square meters) with one bedroom, 1.5 baths, and a great terrace view of the ocean and pool. He’s asking US$189,000 for this unit, fully furnished and ready to move in. In the latest building, the corresponding unit at this location (2.9 square meters larger) costs US$255,300 today on the developer’s price list (without furniture). If you want more info or photographs, please contact the owner (William) directly. Gran Pacifica is a residential community, with houses, villas, condos, and golf, hosting both full- and part-time residents. It’s located 39 miles from downtown Managua, Nicaragua. They have about 60 homes completed and occupied, with more under construction at this time. And while the property features are impressive, the emphasis during development was on the community aspect of the project. The goal was to build different neighborhoods that were, well, neighborly… complete with cobblestone streets and old-style brick sidewalks. A mainstay of Nicaragua’s wild, undeveloped coast, Gran Pacifica occupies an impressive 2,500 acres of coastal property, with 3.5 miles of beachfront. As with Estrella del Mar (above), the beach is well-insulated from the rest of the world… on this beach, you won’t see a soul who is not one of your neighbors. 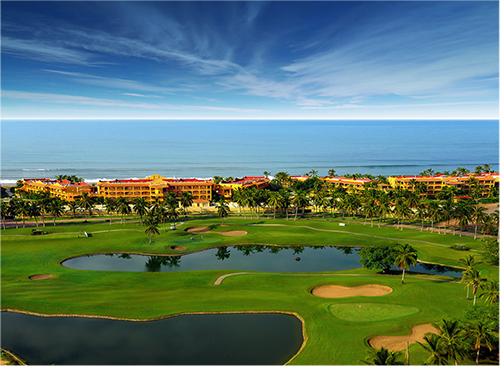 The Gran Pacifica Golf and Country Club offers a great experience for all golfers. 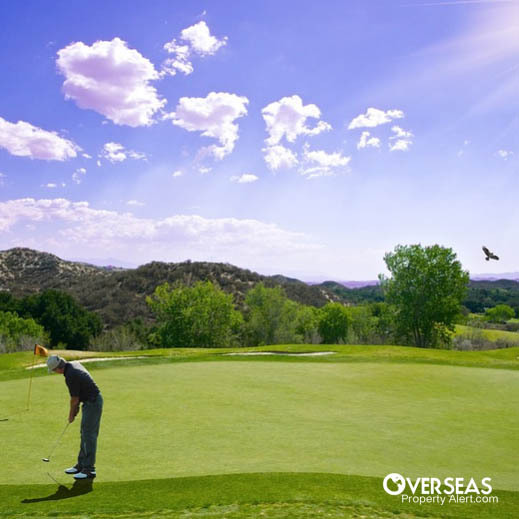 The nearby San Diego River, ocean, ponds, and natural vista make the course an impressive golfing experience. In addition to the course, they offer practice greens, bunkers, a short-game area, and a driving range to work on your golf skills. 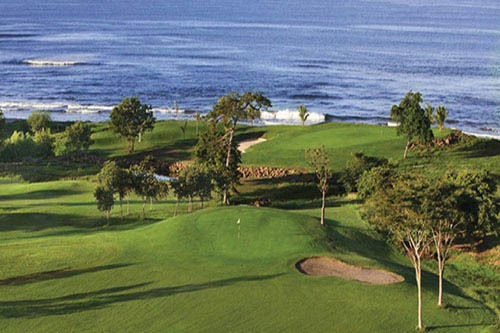 Built under the direction of Tommy Haugen, Gran Pacifica’s course is designed to be 7,133 yards. Planned as an 18-hole course, the first nine holes are completed and open at this time. But you can still play an 18-hole game on the front nine, by using 13 holes and their system of alternate tees and fairways. The adjacent clubhouse offers a fully stocked pro shop with club and cart rentals, combined with a restaurant and bar. Four holes of the front nine are on the ocean. Other amenities at Gran Pacifica include swimming pools, shower facilities, horseback riding with on-site stables, volleyball, and Wi-Fi. The project is wheelchair accessible. The seaside bar and restaurant is a local gathering spot where you will always find fine casual dining, complemented by drinks and wine from the bar. Refined international dishes are featured as well as local Nicaraguan cuisine, including the country’s celebrated beef as well as seafood caught at their own beach. 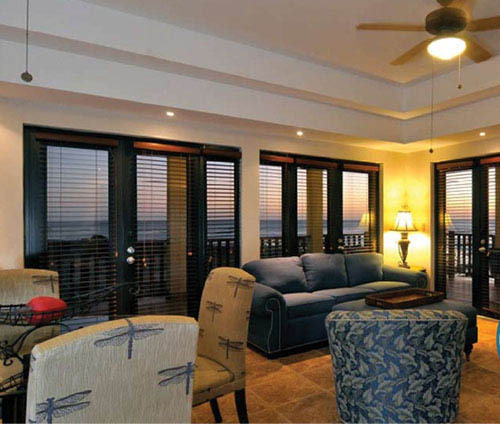 Properties at Gran Pacifica come in all shapes and sizes, from casitas to condos, to houses and grand villas. Lot and home packages start at just US$123,000. If you’d like to live right on the course, they have golf-front homes for under US$200,000. Golf-front lots start at US$49,000. In Las Perlas Village, you can sit on your seafront balcony and watch the sun sink into the Pacific for less than US$140,000. For a bit more luxury, keep an eye on the soon-to-be-released estate neighborhood called Santa Barbara. It’s a high-end neighborhood of luxury estate homes on Gran Pacifica’s best beaches. Each of them will have an ocean view, and many are, in fact, directly on the ocean. If you want to rent your property out when you’re not in residence, full-service property management is available on site. If you have any questions about Gran Pacifica—and what’s on offer there—you can get in touch here. Is Estrella Del Mar Or Gran Pacifica Right For You? I think Gran Pacifica is your best choice if the community aspect of the development is most important. It would be great for full-time or part-year living in a place that’s removed from the hectic lifestyle of Nicaragua’s populated areas. The lifestyle here comes first, with the golf as a great additional benefit. Estrella del Mar would be best as a golfing destination… one that also has nice residential options and a proven course. Since it’s less than 1.5 hours from the United States—and just a few minutes from Mazatlán’s airport—it would be convenient to come down even for a short time. I love reading your articles, particularly the ones about buying properties in Medellín. However, I don’t think you even talked about the severe air pollution issue in Medellín (it’s getting worse and worse)… as if not even an issue for you. How can people live in such a polluted place, even given that there are many good things about living in Medellín? Why do you and Live and Invest Overseas keep promoting Medellín as a place to retire and invest? No, I am not concerned about crime in Medellín, only air pollution. Thanks to Jeff for bringing this up. He’s right, in that I rarely think to mention the air pollution in Medellín… an issue that seems to be getting worse. The air pollution in Medellín varies with weather patterns, the time of year, and your location in the valley. The city is working to improve it (mostly with driving restrictions), but I haven’t noticed any positive change. Some days are clear, and some are smoggy. But why we continue to live in Medellín (and recommend it) is easy. The lifestyle and amenities more than outweigh the problems with air quality… same as residents say about Los Angeles, Pittsburgh, Denver, or Phoenix. It’s an evaluation and decision that each expat makes for themselves. In response to one of your letters about living in a springlike climate, I can highly recommend Mexico’s Rosarito/Ensenada corridor. I have lived in Rosarito about 16 years and I believe the weather is among the best in the world. Our temperatures range from highs of 77 degrees in the summer to about 67 in the winter. Our lows in the winter are about 50 degrees at night. We only get about 10 inches of rain so it’s really beautiful all year around. San Diego is just a short ride across the border, which is another really convenient aspect of living here. Also, living here is an absolute bargain. I have been to about 40 countries and in my opinion we have one of the best, if not the best, climate in the world. We met about six years ago in Quito. I enjoyed your presentations and you gave me many helpful ideas. Please help me again by suggesting an expat hotel in Medellín for a first-time visitor. One of my favorite hotels in Medellín is the Park 10, in the heart of the Zona Rosa. It’s a great place from which to explore the nicest part of the city. If you’d rather stay on the Golden Mile, I like the Estelar, the Dann Carlton Hotel, and the Holiday Inn Express. These are not “expat hotels” (I don’t know of any), but they’re in locations where you’re likely to meet fellow expats… especially the Park 10. But if you’re staying for more than a few days, I’d highly recommend getting a short-term furnished apartment. That way you can see exactly what it’s like to live there. Generally, these rentals are much less than a hotel. Check out The Apartment International for nice rentals, or have a look at Airbnb.